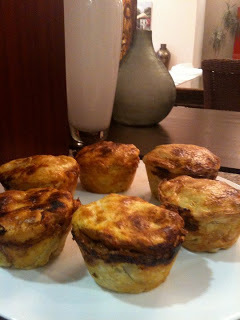 It all started with a picture of my lamb pies. I’d spent the morning baking with the children and was feeling very proud of my culinary achievements. If you had seen some of my previous cooking efforts you’d understand why. Perhaps I was overly excited when I decided to share my lamb pies with the world on Facebook, but I was very, VERY proud of my pies. Complimentary comments drifted in, a few people “liked” my pies, a few comments like “yummy” and “delicious” popped up, my Aunt Jacqui was even kind enough to ask for the recipe. I was glowing in both the heat of my baking trays and my Facebook adulation. A friend, a sweet, doe eyed Scottish mother of adult children, wrote what I imagine she thought was a passing comment. I can’t tell you exactly what the comment was, as it’s been deleted (by her), but it was something like “are there no ends to your talents”. I giggled, I considered my future career move in to the world of nuvo cuisine. I was obviously going to be more Nigella than Martha (sexier and less jail time). Another comment arrived in my inbox, it was from another friend, who had never met the person he was about to correct, he said “*is* there no end”. That was it, nothing else, that was his comment. Ahem, he didn’t even mention my pies? Within moments, another comment popped up from my publicly humiliated friend “oops, sorry “ she said, she acknowledged her hideous grammatical wrong doings over the highly debatable pies and then disappeared. I imagine she promptly went and put her dunce cap on and sat in the corner. I was dumbfounded, but also incredibly curious. Are there grammatical expectations on social media? Did Mark Zuckerberg and his team post a grammatical guideline for Facebook? Maybe I didn’t receive the memo? I thought about Twitter, hundreds of mini status updates being squeezed in to 140 characters, how were they going to break the news to Kanye “Imma let you finish” West and his 2 million followers? As an expat, I wonder if there’s a hint of elitism with our grammatical expectations. I have many friends who have learnt English as a second language and continually feel the need to apologize for their faux pas. After an almost comical year of disastrous French lessons, I would hate to attempt a grammatically correct sentence, especially when used for grammatical public consumption. Inshallah, one day I may be able to string three Arabic words together. What about if you’re dyslexic? Are you excused for getting your mords wixed up? I’m not sure about you, but I’m not sitting around considering the words of Shakespeare while I text and tweet? It’s more likely I’m either at swimming training with one eye on a child, cooking dinner, in between meetings or negotiating bath time. After seven failed attempts at bed time this evening, the second little traveler arrived at the end of my bed to discuss if we could change hot lunch day, “get in to bed…..and have you let your sister cut your hair again?” I screamed. Yes, I’m a terrible mother. It appears we’re all not perfect, but my pies is. So, what do you think? Are Facebook and Twitter friendly, casual conversations, designed for all walks of life? Is there ever an excuse for bad grammar?